Cape Horn island (Dutch: Kaap Hoorn; Spanish: Cabo de Hornos; named after the city of Hoorn in the Netherlands) is the southernmost headland of the Tierra del Fuego archipelago of southern Chile. Cape Horn is widely considered to be the most southerly point of South America, and marks the northern boundary of the Drake Passage; for centuries it has been regarded as a major milestone by which sailing ships carrying trade goods around the world marked their passage. Cape Horn was noted as the halfway point from England to Australia during the nineteenth century clipper route. The waters around the cape are particularly hazardous, owing to strong winds, large waves, strong currents and icebergs. These dangers have made Cape Horn notorious as a sailors' graveyard. The number of ships rounding Cape Horn from the Atlantic Ocean to the Pacific Ocean dropped greatly when the Panama Canal opened in 1914. Sailing around the Horn is widely regarded as one of the major challenges in yachting, and important yacht races, including Single-Handed Trans-Atlantic Race or OSTAR continue to sail this route, sometimes as part of a circumnavigation of the globe. 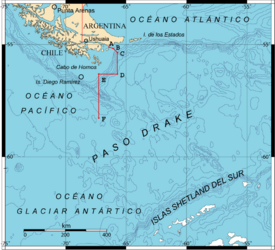 The southern part of South America, including Cape Horn island, the Drake Passage, and the South Shetland Islands. Cape Horn is the southernmost point of land closely associated with South America; it is located on Isla Hornos in the Hermite Islands group, at the southern end of the Tierra del Fuego archipelago. It marks the north edge of the Drake Passage, the strait between South America and Antarctica. The dividing line between the Atlantic and Pacific oceans runs along the meridian of Cape Horn, from Tierra del Fuego to the Southern Ocean. It is located in Cabo de Hornos National Park. The terrain is entirely treeless, although it is quite lush owing to the frequent precipitation. The climate in the region is generally cool, owing to the southern latitude. 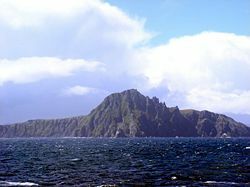 There are no weather stations in the group of islands including Cape Horn; however, a study in 1882–1883 found an annual rainfall of 1,357 millimeters (53.42 in), with an average annual temperature of 5.2 °C (41.4 °F). Winds were reported to average 30 kilometers per hour (19 mph), with squalls of over 100 kilometers per hour (62 mph) occurring in all seasons. Contemporary weather records for Ushuaia, 146 kilometers (91 mi) north, show that summer (January–February) average temperatures range from highs of 14 °C (57 °F) to lows of 5 °C (42 °F); in winter (July), average temperatures range from 4 °C (40 °F) to −2 °C (29 °F). Cloud cover is generally high, with averages from 5.2 eighths in May and July to 6.4 eighths in December and January. 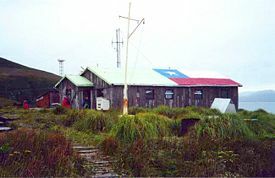 Precipitation is high throughout the year: The weather station on the nearby Diego Ramirez Islands, 109 kilometers (68 mi) south-west in the Drake Passage, shows the greatest rainfall in March, averaging 137.4 millimeters (5.41 in); while October, which has the least rainfall, still averages 93.7 millimeters (3.69 in). Wind conditions are generally severe, particularly in winter. In summer, the wind at Cape Horn is gale force up to 5 percent of the time, with generally good visibility; however, in winter, gale force winds occur up to 30 percent of the time, often with poor visibility. 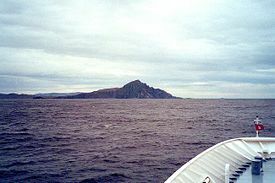 The islands around Cape Horn. The cape lies within Chilean territorial waters, and the Chilean Navy maintains a station on Hoorn Island, consisting of a residence, utility building, chapel, and lighthouse. A short distance from the main station is a memorial, including a large sculpture featuring the silhouette of an albatross, in honor of the sailors who died while attempting to "round the Horn." However, the Chilean Navy station, including the lighthouse, and the memorial are not located on Cape Horn itself, which is rather inaccessible both by land and by sea, but in another land-point about a mile farther east-northeast. In the real Cape Horn there is a 4 meter (13 ft) fiberglass light tower with a focal plane of 40 meters (131 ft) and a range of about 21 km (13 mi), which is the authentic Cape Horn lighthouse. Cape Horn is part of the Commune of Cabo de Hornos, whose capital is Puerto Williams; this in turn is part of Antártica Chilena Province, whose capital is also Puerto Williams. The area is part of the Magallanes y la Antártica Chilena Region of Chile. Puerto Toro, a few miles south of Puerto Williams, is the closest town to the cape, and the southernmost town in the world. In 1525 the vessel San Lesmes commanded by Francisco de Hoces, member of the Loaísa Expedition, was blown south by a gale in front of the Atlantic end of Magellan Strait and reached 56° S where they thought to see Land's End. In September 1578, Sir Francis Drake, in the course of his circumnavigation of the world, passed through the Strait of Magellan into the Pacific Ocean. Before he could continue his voyage north his ships encountered a storm, and were blown well to the south of Tierra del Fuego. The expanse of open water they encountered led Drake to guess that far from being another continent, as previously believed, Tierra del Fuego was an island with open sea to its south. This discovery went unused for some time, as ships continued to use the known passage through the Strait of Magellan. In the evening [25 January 1616] the winde was South West, and that night wee went South with great waves or billowes out of the southwest, and very blew water, whereby wee judged, and held for certaine that … it was the great South Sea, whereat we were exceeding glad to thinke that wee had discovered a way, which untill that time, was unknowne to men, as afterward wee found it to be true. At the time it was discovered, the Horn was believed to be the southernmost point of Tierra del Fuego. The unpredictable violence of weather and sea conditions in the Drake Passage made exploration difficult, and it was only in 1624 that the Horn was discovered to be an island. It is a telling testament to the difficulty of conditions there that Antarctica, only 650 kilometers (400 mi) away across the Drake Passage, was discovered as recently as 1820, despite the passage having been used as a major shipping route for 200 years. Cape Horn was originally given the Dutch name "Kaap Hoorn," in honor of the Dutch city of Hoorn; it became known in English as "Cape Horn," and in Spanish as "Cabo de Hornos" (which literally means "Cape of Ovens"). It is commonly known to sailors simply as The Horn. The clipper route followed by ships sailing between England and Australia/New Zealand passed around Cape Horn. From the 1700s to the early 1900s, Cape Horn was a part of the clipper routes which carried much of the world's trade. Clipper ships sailed round the Horn carrying wool, grain, and gold from Australia back to Europe; much trade was carried around the Horn between Europe and the Far East; and trade and passenger ships traveled between the coasts of the United States via the Horn. The Horn exacted a heavy toll from shipping, however, owing to the extremely hazardous combination of conditions there. The only facilities in the vicinity able to service or supply a ship, or provide medical care, were in the Falkland Islands. The businesses there were so notorious for price-gouging that damaged ships were sometimes abandoned at Port Stanley. While most companies switched to steamers and later used the Panama Canal, German steel-hulled sailing ships like the Flying P-Liners were designed since the 1890s to withstand the weather conditions around the Horn, as they specialized in the South American nitrate trade and later the Australian grain trade. None of them were lost around the Horn, but some, like the mighty Preußen, were victims of collisions in the busy British channel. A particular historic attempt to round the Horn, that of HMS Bounty in 1788, has been immortalized in history due to the subsequent Mutiny on the Bounty. This abortive Horn voyage has also been portrayed (with various historic accuracy) in three major motion pictures about Captain William Bligh's mission to transport breadfruit plants from Tahiti to Jamaica. The mutiny occurred in the South Pacific during the voyage to the West Indies. The transcontinental railroads in North America, as well as the Panama Canal that opened in 1914 in Central America, led to the gradual decrease in use of the Horn for trade. As steamships replaced sailing ships, Flying P-Liner Pamir became the last commercial sailing ship to round Cape Horn laden with cargo, carrying grain from Port Victoria, Australia to Falmouth, England in 1949. Many modern tankers are too wide to fit through the Panama Canal, as are a few passenger ships and several aircraft carriers. But there are no regular commercial routes around the Horn, and modern ships are rarely seen. There are a number of potential sailing routes around the tip of South America. 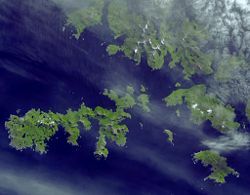 The Strait of Magellan, between the mainland and Tierra del Fuego, is a major—although narrow—passage, which was in use for trade well before the Horn was discovered; the Beagle Channel, between Tierra del Fuego and Isla Navarino, offers a potential, though difficult route; and there are various passages around the Wollaston and Hermite Islands to the north of Cape Horn. All of these, however, are notorious for treacherous williwaw winds, which can strike a vessel with little or no warning; given the narrowness of these routes, there is a significant risk of then being driven onto the rocks. The open waters of the Drake Passage, south of Cape Horn, provide by far the widest route, at about 800 kilometers (500 mi) wide; this passage offers ample sea room for maneuvering as winds change, and is the route used by most ships and sailboats, despite the possibility of extreme wave conditions. 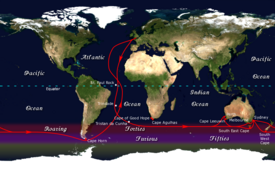 Several factors combine to make the passage around Cape Horn one of the most hazardous shipping routes in the world: the fierce sailing conditions prevalent in the Southern Ocean generally; the geography of the passage south of the Horn; and the extreme southern latitude of the Horn, at 56° south. The prevailing winds in latitudes below 40° south can blow from west to east around the world almost uninterrupted by land, giving rise to what are known as the "roaring forties" and the even more wild "furious fifties" and "screaming sixties." These winds are hazardous enough in themselves that ships traveling east would tend to stay in the northern part of the forties (not far below 40° south latitude); however, rounding Cape Horn requires ships to press south to 56° south latitude, well into the zone of fiercest winds. These winds are further exacerbated at the Horn by the funneling effect of the Andes and the Antarctic peninsula, which channel the winds into the relatively narrow Drake Passage. The strong winds of the Southern Ocean give rise to correspondingly large waves; these waves can attain enormous size as they roll around the Southern Ocean, free of any interruption from land. At the Horn, however, these waves encounter an area of shallow water to the south of the Horn, which has the effect of making the waves shorter and steeper, greatly increasing the hazard to ships. If the strong eastward current through the Drake Passage encounters an opposing east wind, this can have the effect of further building up the waves. In addition to these "normal" waves, the area west of the Horn is particularly notorious for rogue waves, which can attain heights of up to 30 meters (100 ft). The prevailing winds and currents create particular problems for vessels attempting to round the Horn against them, from east to west. Although this affects all vessels to some extent, it was a particularly serious problem for traditional sailing ships, which could make very little headway against the wind at the best of times; modern sailing boats are significantly more efficient to windward and can more reliably make a westward passage of the Horn. Ice is a hazard to sailors venturing much below 40° south. Although the ice limit dips south around the horn, icebergs are a significant hazard for vessels in the area. In the South Pacific in February (summer in Southern Hemisphere), icebergs are generally confined to below 50° south; but in August the iceberg hazard can extend north of 40° south. Even in February, though, the Horn is well below the latitude of the iceberg limit. These hazards have made the Horn notorious as perhaps the most dangerous ship passage in the world; many ships were wrecked, and many sailors died, attempting to round the Cape. Joshua Slocum, the first person to circumnavigate the globe solo, was forced by extreme weather to use inshore routes at the tip of South America rather than circle the Horn. Despite the opening of the Suez and Panama Canals, the Horn remains part of the fastest sailing route around the world, and so the growth in recreational long-distance sailing has brought about a revival of sailing via the Horn. Owing to the remoteness of the location and the hazards there, a rounding of Cape Horn is widely considered to be the yachting equivalent of climbing Mount Everest, thus many sailors seek it out for the sake of the challenge. Joshua Slocum was the first single-handed yachtsman to successfully pass this way (in 1895) although in the end, extreme weather forced him to use some of the inshore routes between the channels and islands and it is believed he did not actually pass outside the Horn proper. If one had to go by strict definitions, the first small boat to sail around outside Cape Horn was the 42-foot (13 m) yacht Saoirse, sailed by Conor O'Brien with three friends, who rounded it during a circumnavigation of the world between 1923 and 1925. In 1934, the Norwegian Al Hansen was the first to round Cape Horn single-handed from east to west—the "wrong way"—in his boat Mary Jane, but was subsequently wrecked on the coast of Chile. The first person to successfully circumnavigate the world single-handed via Cape Horn was Vito Dumas, who made the voyage in 1942 in his 33-foot (10 m) ketch Lehg II; a number of other sailors have since followed him, including Webb Chiles aboard "Egregious" who in December 1975 became the first American to round Cape Horn single-handed. Today, there are several major yacht races held regularly along the old clipper route via Cape Horn. The first of these was the Sunday Times Golden Globe Race, which was a single-handed race; this inspired the present-day Around Alone race, which circumnavigates with stops, and the Vendée Globe, which is non-stop. Both of these are single-handed races, and are held every four years. The Volvo Ocean Race is a crewed race with stops which sails the clipper route every four years. The Jules Verne Trophy is a prize for the fastest circumnavigation of the world by any type of yacht, with no restrictions on the size of the crew (no assistance, non-stop). Finally, the Global Challenge race goes around the world the "wrong way," from east to west, which involves rounding Cape Horn against the prevailing winds and currents. The village of Puerto Williams on nearby Navarino Island, where many Yagán reside today. 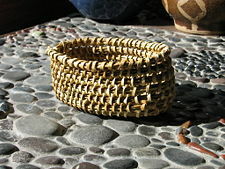 A traditional Yagán basket, woven by Abuela Cristina, the last known full-blooded Yagán. The Cape Horn Biosphere Reserve is located in the extreme south of Chile and comprises marine areas, islands, fjords, channels, forests and moorland. It covers an area of approximately 49,000 km². All biosphere reserves include core zones (no significant infrastructure development), buffer zones (light development) and transition zones (more traditional development under a sustainable rubric). In the case of Cape Horn Biosphere Reserve, the core zone is constituted of Alberto de Agostini National Park and Cabo de Hornos National Park, which are strictly protected under Chilean law and by the biosphere reserve status. The Cape Horn Archipelago hosts the the world's southernmost forested ecosystem and protects 5 percent of the world's bryophyte diversity (mosses and liverworts). However, it is confronting serious threats related to tourism, development of real estate projects, invasive exotic species and salmon farming. In addition, the Archipelago represents the southernmost territory in the world with pre-Columbian populations, the Yagán people. Today they are the most threatened of the Chilean indigenous cultures. Some 2,200 Yagán live in the transition area with a concentration in Puerto Williams. They constitute a nomadic culture that has inhabited the southern end of the American continent for centuries. Today they live in the coastal sectors, navigating the channels of Cape Horn and the sub-antarctic archipelago region to the south of the Tierra del Fuego. Most, if not all, of today's Yagán are mixed blood descendants of Yagán and the first non-native colonists. The Biosphere Reserve supports economic and human development through an "alliance between science and tourism to promote sustainable development." It also attempts to stimulate sustainable use of marine and silvo-agricultural natural resources which constitute the base of the local economy. ↑ James C. Cokendolpher and L. Dolly Lanfranco, Opiliones from the Cape Horn Archipelago, Journal of Arachnology. Retrieved February 11, 2009. ↑ Weather Underground, Ushuaia: Monthly Normals. Retrieved February 11, 2009. ↑ Weather Underground, Isla Diego Ramirez: Monthly Normals. Retrieved February 11, 2009. ↑ U.S. Navy Marine Climatic Atlas of the World, August 1995, South Pacific Ocean. Retrieved February 11, 2009. ↑ The Golden Hind, Voyage of the Golden Hind. Retrieved February 11, 2009. ↑ 8.0 8.1 Paolo Venanzangeli, Cape Horn the Terrible, Nautica. Retrieved February 11, 2009. 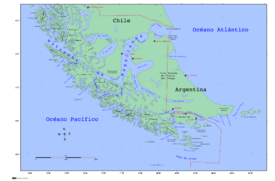 ↑ 9.0 9.1 Essortment, Perilous Cape Horn. Retrieved February 11, 2009. ↑ Don Holm, The Circumnavigators: Around the Three Capes (New York: Prentice-Hall, 1974, ISBN 0131344528). Retrieved February 11, 2009. ↑ Francis Chichester, Along the Clipper Way: By Francis Chichester, with Extracts from Francis Drake [and Others] (London: Hodder and Stoughton, 1967, ISBN 0340001917), 134. ↑ Magazine on European Research, Rogue waves. Retrieved February 11, 2009. ↑ United States, Atlas of Pilot Charts, South Pacific Ocean (Annapolis, MD: Lighthouse Press, 2005, ISBN 1577852028). ↑ Richard Konkolski, Webb Chiles, Solo Circumnavigation. Retrieved February 11, 2009. ↑ R. Rozzi, F. Massardo, C.B. Anderson, A. Berghoefer, A. Mansilla, M. Mansilla, and J. Plana, Reserva de Biosfera Cabo de Hornos (Punta Arenas, Chile: Ediciones de la Universidad de Magallanes). ↑ 18.0 18.1 UNESCO, Biosphere Reserve; Cabo de Hornos. Retrieved February 11, 2009. Apollonio, Spencer. 2000. The Last of the Cape Horners: Firsthand Accounts From the Final Days of the Commercial Tall Ships. Washington, D.C.: Brassey's. ISBN 157488283x. Coloane, Francisco, and David A. Petreman. 2003. Cape Horn and Other Stories From the End of the World. Discoveries. Pittsburgh, PA: Latin American Literary Review Press. ISBN 1891270176. Knox-Johnston, Robin. 1970. A World of my Own; the Single-Handed, Non-Stop Circumnavigation of the World in Suhaili. New York: Morrow. OCLC 55248. Knox-Johnston, Robin. 1995. Cape Horn: A Maritime History. London: Hodder & Stoughton. ISBN 0340415274. Murphy, Dallas. 2004. Rounding the Horn: Being the Story of Williwaws and Windjammers, Drake, Darwin, Murdered Missionaries and Naked Natives—a Deck's-eye View of Cape Horn. New York: Basic Books. ISBN 0465047599. Riesenberg, Felix, and William A. Briesemeister. 1995. Cape Horn: The Story of the Cape Horn Region … : Illustrated with Charts and Photographs. Woodbridge, CN: Ox Bow Press. ISBN 1881987043. Schouten, Willem Corneliszoon, William Phillip, and Grenville Kane. 1619. The Relation of a Wonderfull Voiage made by William Cornelison Schouten of Horne: Shewing how South from the Straights of Magelan, in Terra del-Fuogo, he Found and Discouered a newe Passage Through the Great South Sea, and That way Sayled Round about the World. London: Imprinted by T.D. for Nathanaell Nevvbery, and are to be sold at the signe of the Starre, vnder S. Peters in Corne-hill, and in Pope-head Alley. OCLC 80294355. This page was last modified on 9 January 2017, at 16:44.